Fairway woods can perform better than traditional irons, but often intimidate new golfers. Learning how to hit the fairway wood is a big step forward for any golfer. Many beginners and high-handicappers wouldn't even dream of hitting a wood off the fairway because it's simply much easier to use a shorter club like an iron or a hybrid. But a golfer who can confidently swing a fairway wood has a greater chance of getting the ball to the green in fewer strokes on a long par-4 or a par-5. When hitting the ball from the fairway, give yourself a chance to get the ball in the air quickly. When you hit an iron, place the ball in the middle of your stance and hit down on it. With a wood on the fairway, play the ball between the center of your stance and the inside of your left heel (for a right-handed golfer). 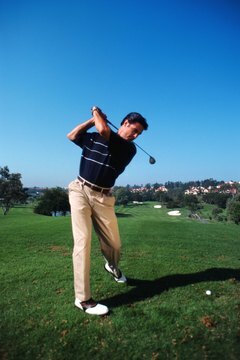 When hitting the ball with the fairway wood, use a long, sweeping motion rather than a sharp, downward swing. Concentrate on form rather than power. A well-paced swing with good mechanics will help you more than if you try to supply extra power. A full hip turn and follow-through is needed when finishing your swing with a wood off the fairway. Finish with your weight on your left foot and your hips (belly button) facing the target. That will allow you to get excellent extension, which translates into maximum distance.